Every tree near to every property in the land presents some risk. Mainly, people accept the potential risks trees might cause, and don’t start a lengthy legal process to destroy them. I know I’m not the only person to have been following with interest the protests in the village of Irton, near Scarborough. 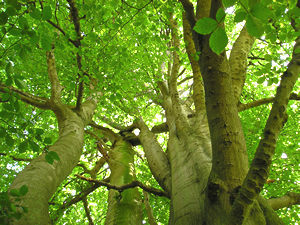 The protests are in response to a judge’s ruling that a beech tree on the village’s main street should be felled. Everyone who thinks trees enhance a place should care about this case. The tree had been protected by a Tree Preservation Order, but these can be overruled, as this one has been, by the judge’s verdict that the tree is a ‘public nuisance’. The tree was due to be felled last week, but a spontaneous protest by Mark Snow, who climbed up into it, prevented this happening. So far. This expensive dispute began because of the concerns of one household. The householders who moved in to the property closest to the tree. The house isn’t a listed building. It’s a late 20th century/early 21st century house. Nothing special. The owners submitted a planning application to redevelop the site, a few years back, so they clearly don’t see the house as anything special either. Yet it – or its drains, or its boundary wall – are now judged to be of more importance – by someone who did what they’re paid to do, and made a decision, after a long-running and somewhat bizarre battle. So the tree is coming down. The tree is well-established, well-shaped, healthy, and has been a focal point of the street for many decades. You don’t have to be a hippy tree-hugger to appreciate a handsome tree that you maybe pass every day on your way to work. We’ve always had an appreciation of trees – back in our ancient history, and now – and plant them as a sign of hope for the future, and commemoration of the past. Because we know that they’re a living thing that outlives us. Well, usually. Unless they’re near the boundary of a property later bought by someone who mounts a legal battle to have them felled. 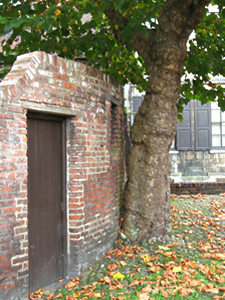 Established trees often do find their way into our old cracked drains, and under walls. 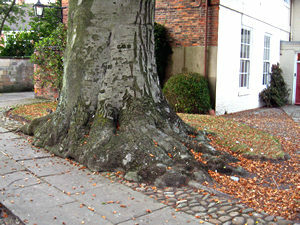 Old walls tend to bend and flex and accommodate tree roots. Modern walls perhaps don’t. Drains and sewers are often repaired and renewed, perhaps because of tree root damage, perhaps because they’re old and cracked and needed replacing anyway. York has many handsome trees planted very close to buildings. Some of the buildings are ancient and valuable, of far more significance than the modern block at Irton. With trees far older than the Irton tree, close to walls and buildings of far more significance, we seem to have managed to deal with potential problems caused by tree roots. 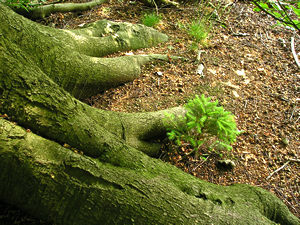 But perhaps everyone who lives close to an established tree should get legal advice, and apply to have it chopped down. Your local authority may be panicked into falling in with your wishes, as they can’t afford to fight you, or don’t realise that repairing the drains might be a cheaper option.